CCHS teacher Jennifer VanIwarden shares project-based learning strategies with staff. I want to thank our web systems coordinator Elizabeth Gamache for all she has done to get our web based Infinite Campus system up and running, and for all she has done setting up Schoology for the development of high school blended learning classes. Thanks to her effort teachers can access 2018-19 courses in Schoology and will be able to begin building them. The Schoology dashboard has been updated, but will function the same as before. 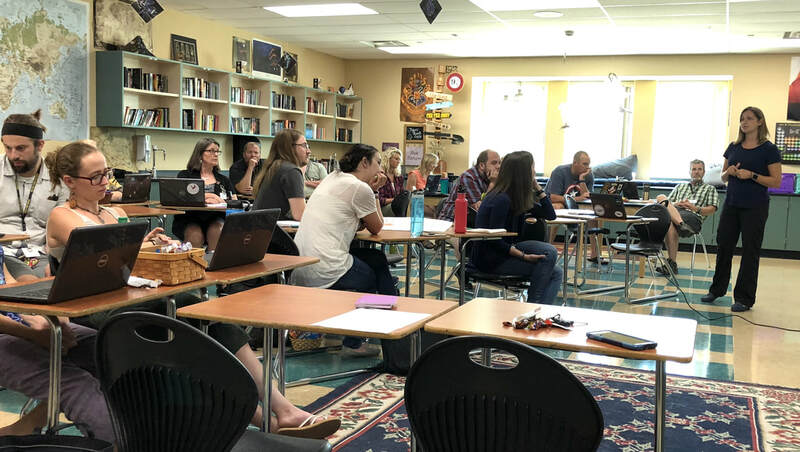 Last week the district held an engaged learning professional development session attended by teachers from all grade levels. The work focused on project-based learning opportunities, how to give students some choice in what they learn, and how to increase rigor and interest. This is exciting work! Newly appointed Director of Special Services Tim Renn is working from a temporary office for now. On Monday night, the Cañon City Board of Education approved several significant staff assignments. Because Director of Special Services Lynnette Steinhoff accepted a new position in Douglas County last week, we had some difficult decisions to make. First, we offer Lynnette our congratulations and wish her the best of luck in her new position. Unfortunately, this leaves quite a leadership gap in our Special Services department. After consideration of many options, Assistant Superintendent Adam Hartman and I decided to make the following recommendations to the Board, which were approved. 1. Accept Ms. Steinhoff's resignation and release her to move on to her new position as soon as is reasonable. 2. Appoint Mr. Tim Renn, current Principal at Cañon City Middle School as Interim Director of Special Services as soon as possible so he can receive transition support from Ms. Steinhoff, while also requiring a thorough evaluation of his work by March 2019 at which time a decision will be made to continue him in his new role, or to open the position for a wider search. 3. Appoint Mr. Jesse Oliver, current Assistant Principal at Cañon City Middle School as Interim Principal of Cañon City Middle School, as soon as is possible so he can build a leadership team and focus on opening the school, while also requiring a thorough evaluation of his work by March 2019 at which time a decision will be made to continue him in his new role or open the position for a wider search. 4. Open an immediate search for a Cañon City Middle School Assistant Principal to support Mr. Oliver in leading the school. Among other reasons, this recommendation was made because over the past three years Mr. Renn has guided the Cañon City Middle School staff to transform into an outstanding school. He possesses the positive leadership presence we seek, with one particular aspect being his ability to bring people together to work toward a common cause. Mr. Renn's appointment as Special Services Director creates a leadership gap at Cañon City Middle School, a learning environment with outstanding momentum. However, over the past three years, we think Mr. Oliver has grown tremendously in his instructional leadership knowledge and has been key in guiding Cañon City Middle School's student behavior culture in a positive direction. Because of this, district leaders felt he is ready to take on the building leadership position. On another front, this summer the Cañon City School District invested a significant amount of its Rural Sustainability funding to upgrade middle school technology labs. Grade 6-8 students had been receiving technology and engineering instruction using outdated resources, so this is an exciting development. These lab upgrades will be ready for Cañon City Middle School, Cañon Exploratory, and Harrison School students in time for the start of this school year. Chromebooks have been purchased, delivered, are imaged and right now systems are being established to efficiently assign them to all grade 9-12 students before the end of August. More than 1,000 Chromebooks are being prepared for Cañon City High School students. Our new secure entry at Cañon City High School is beginning to take shape. High school water lines continue to be installed. A new security fence near the Art room will be installed this week. Also, our new ADA accessible restroom will be be tiles and bathroom fixtures will be installed soon after that. At McKinley and Lincoln crews are installing cabinetry and carpet tile as they finish the water line replacement project. Recently installed windows are being cleaned, and brand new window coverings will soon be installed. We are hopeful these projects will be punch listed by the end of this week. At Harrison and CCHS front entry vestibule windows are being installed, and at Cañon Exploratory School new electric circuits are being run as part of its safe entry upgrade project. Our construction partners at GE Johnson are feeling all of our project timelines are tracking well, and are still hopeful all will be done before children arrive fro school. In last week’s edition I included a full description of construction work we’ll soon do at Washington Elementary. This week I’m reminding readers what will take place on the Cañon City Middle School campus during the next two years. Due to serious facilities deficiencies at the middle school campus the Cañon City School District considered many options to address its facility needs. A preliminary concept drawing of how CCMS will look when the project is complete. One consideration was to close Washington due to structural issues and costs related to needed upgrades. At that time we proposed moving Washington (K-5) children across town to our Harrison K-8 facility (built in 2006), then moving Harrison's 6th through 8th-grade students (roughly 350) to Cañon City Middle School to make use of some available space there. Doing so would have resulted in the district losing a highly valued and in-town neighborhood school option in Washington, while also adding a long-term, expensive commitment to transporting children to distant points in town. Additionally, there would have been significant costs associated with bringing Cañon City Middle School up to the task of adding 350 additional students. Another option we explored was closing Washington, tearing down Cañon City Middle School, and building one new facility to replace both. Variances to this option included turning this new building into a K-8 facility (by moving Washington and CCMS students there), or transporting all Cañon City Middle School students to Harrison to create a larger middle school, then building a new elementary school for the remaining Washington and Harrison K-5 students. This solution would also have added a long-term, expensive commitment to transporting students to far points in our community. After communicating these options through digital media and local newspaper stories, conducting parent and public surveys, holding well attended informational meetings, inviting public comment, and leading community tours of the facilities in question, a new option emerged to build a replacement Washington and a replacement Cañon City Middle Schools on their current properties, while tearing down all sections of the Cañon City Middle School building that were added after 1925. Through this plan, the district sought to repurpose the 1925 historical core of Cañon City Middle School. Options included moving district administration, online, alternative to expulsion, and early childhood programs into the facility, followed by selling the buildings that currently house those programs and services. We also pursued the interest to occupy this building expressed from the folks who operate our local senior center, the local Boys and Girls Club, and a technology industry incubator run by the Fremont Economic Development Corporation called Tech Start. In the end, none of these solutions proved viable because all potential users of the 1925 core facility found upgrade costs to be exorbitant. When we presented this option in the form of a BEST grant application in spring 2017, the BEST board rejected it. However, we were awarded a $5 million BEST multi-facility repair grant in spring 2017 not meant to address any Washington or Cañon City Middle School deficiencies. Thus, we needed to go to voters to secure our match. Before doing so, we engaged CDE Capital Construction staff about an alternate solution for CCMS that involved tearing down the entire structure (including the 1925 historic core) minus the modern gymnasium, then building a replacement school attached to it. Such a proposal aligned to the feedback offered by 2017 BEST board members to lower overall costs (the estimate for this project came in at $24 million as opposed to the prior application amount of $36 million). Our CDE regional representative indicated this new approach was a viable solution. As a result, we placed a question on the November 2017 ballot to provide an $8 million match to fund it, along with our required match for the 2017 multi-facility BEST grant and a match for a new Washington facility grant. This was approved by voters by only 75 votes out of nearly 9,000 cast. After the election, we worked to double and triple check our cost estimates, program requirements, and square footage. However, just before the BEST grant submission deadline we learned the CDE Capital Construction Department might not favorably view any plan involving the demolition of the 1925 core of Cañon City Middle School. In response, we took a step back and sought a solution that would include the renovation of the 1925 core building. In developing our solution, our first step was to determine if we could renovate the 1925 core and modern gymnasium and construct a new wing on the site while school remains session. We discovered this to be feasible if we were first to first demolish the vocational building that houses our band, technology, and construction trades programs (temporarily moving them into parts of the main building for a year), build new classroom space to attach the 1925 core to the modern gymnasium, transfer instruction from the 1925 core into that new space, then renovate the 1925 core before demolishing the remaining parts of the building that are not of historic interest. We will need an 18-month window to execute such a plan. The renovation of the 1925 core will address ADA compliance issues related to entries, restrooms, and escape routes. Classroom floor plans will be reconfigured to serve modern-day class sizes. We'll abate all friable asbestos and install a modern, quiet air circulation system. We'll also upgrade the building’s intercom system, flooring, walls, windows, plumbing, and electrical systems. Finally, we'll eliminate structural issues related to the old gymnasium and auditorium through demolition. We’ll orient a new addition to the north and east of the historic 1925 core, attaching it to the modern gym to increase facility security by limiting the number of doors students must enter and exit when changing classes. This will also serve as a new, more secure, and ADA accessible main entry facing the southeast. The compact nature of our plan allows for parking off Main Street, creating an ideal separation between parent/bus/drop off traffic and staff parking. As a result of these changes the CCMS campus will also benefit from more green space. Cañon City Schools and its Design-Build team will carefully consider all design elements from crucial issues surrounding durability of finishes to cost of long-term maintenance. We’ll also contemplate features related to how the school will function, which programs it will support, how many students it will serve, how the students will flow through the facility, and how visitors and parents will access the campus. Our plan also allows us the option to retain the use of a current geothermal field and athletic field space. We'll encourage community to use of the facility. Recreation programs and community performing arts programs will be given secure after-hours access. Cañon City Schools is also partnering with Valley-Wide Health services to create and staff a school-based health center to serve students, staff, and community. Though we will lose a valued traditional-style auditorium, our plan allows for flexible use of a commons-gymnasium area for public performances in an auditorium-like setting. We'll locate these near the main entry of the building to allow use in a controlled manner. Our plan also supports a variety of learning activities with state-of-the-art classrooms that integrate instructional technology, breakout spaces, and small and large group instruction rooms. We’ll also locate the media center and art room for easy access to each learning community. Mechanical systems will be both highly efficient and based on proven strategies for the Fremont County region. Quiet and efficient cooling and heating, highly insulated exterior walls and less complex systems we can operate and maintain long-term at a lower cost are vital components of our plan. Due to the need to demolish the old vocational facility, we’ll lose access to our district’s grounds facility. Because of this, we have included in our plan the construction of a safe, modern metal structure on the Cañon City High School campus to serve this purpose. On Monday I attended back to school training with district office staff, and I attended a board work session and regular meeting. On Tuesday we held a fully attended Superintendent Advisory Council meeting, a weekly construction progress meeting, and I traveled to Colorado Springs to meet with Wendy Birhanzel and Ted Knight, two of the experts we bring in to review the instructional progress of our schools. On Wednesday I attended a Colorado Education Initiative Assessment for Learning Program meeting phone meeting, and a P-TECH grant internship meeting. I traveled on Thursday and Friday to attend a family wedding in Tucson, Arizona. Director of Operations Jeff Peterson updates school office staff on summer construction progress. On Monday I’ll catch up on email while on the road back from Tucson. On Tuesday I have a monthly Cañon City Police Department touching base meeting, Superintendent’s Advisory Council, and a weekly Design-Build team meeting. During the rest of the week I have a Fremont Facilities Corporation meeting, a central office staff monthly meeting, a various meetings related to students and staff, and a tour of new San Luis Valley schools in preparation for our school design process.